Above: Just a few of my old fans and coolers, none of which I can bring myself to throw out. Everyone chases some kind of low-key but elusive white whale, a casual desire or goal that remains forever out of reach. For some, it’s finding the best possible cup of coffee, or the perfect pair of jeans. For me, it’s getting my PC CPU to run below 70 degrees Celsius while under load. This goal has eluded me for years. 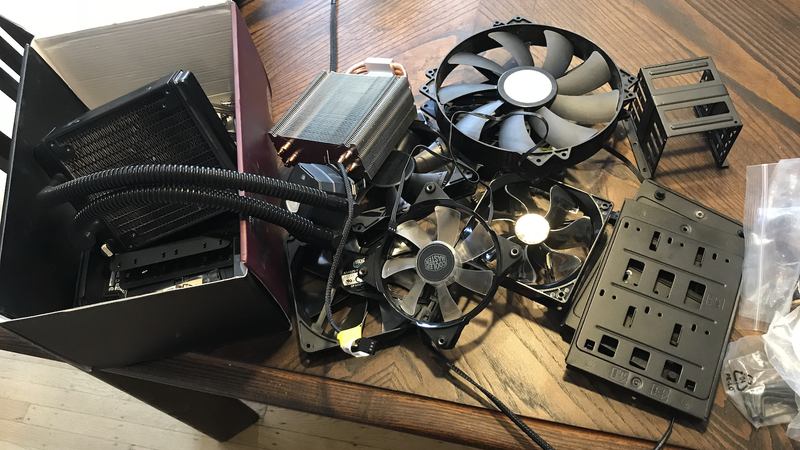 It has eluded me through four or five different cooling solutions, and through at least three separate PC builds. I have used liquid and air cooling. I have overclocked my CPU and removed the overclock from my CPU. I have air conditioned my office so that it remains around 24 degrees in the summer. Still, my CPU temperatures remain unfortunately high. It’s become an incessant annoyance, like a mosquito bite I can’t stop scratching. My current CPU is an Intel Core i7 7700k. I’ll go months at a time without checking my CPU temperatures, safe in the knowledge that it’s basically “fine” if my CPU runs a little hot, or occasionally gets into the 80s. Then I’ll make the mistake of checking one of the many CPU temperature apps I have installed, and I’ll fall down the rabbit hole again. The obsession reared its head once again over the last couple weeks, when I was playing an early copy of Monster Hunter: World. The game crashed a few times, which caused me to check to see if an overheating CPU might have been the culprit. Turns out it wasn’t—the crashes were patched out of the game in a pre-release update last week, though the new Nvidia driver causes my game to crash in a different way. However, MH:W was pushing my CPU into the mid-90s, which is the kind of temperature that necessitates action, since it can really damage your chip over time. I opened up my PC and began moving things around. I unscrewed fans, and screwed them back in. I scraped off and reapplied my thermal paste. I hopped into my BIOS and began making tweaks. I was unable to find a solution, which made me all the more fixated. I’d be having dinner with friends, when all at once a thought would jump into my head—what if I attached a second set of fans to the back of the radiator, in a push/pull configuration? No, wait, there’s no room for that in my case. But what if I put it in the front of the case? Wait, what was everyone talking about? I’m still loving the quieter fans I swapped in, but my temperatures are yet again less than ideal. I don’t know what happened in the time between then and now, but my bet is that my all-in-one liquid cooler, a Corsair H100i V2, has stopped working as efficiently as it used to. Some cursory Googling led me to believe that could be for a variety of reasons, from blockage in the coolant flow to a straight-up pump malfunction. 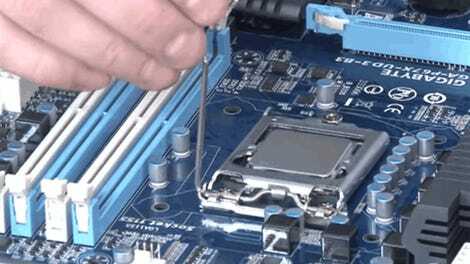 However, Googling problems with your CPU cooling is a lot like googling medical issues; the more I Google, the more convinced I become that something is direly wrong. I’ve spent the last week experimenting with an increasingly chaotic set of variables including removing my CPU overclock entirely, buying and applying new thermal paste (I finally ran out of the old Cooler Master stuff I had, and bought a tube of Arctic MX-4 that seems fine), and repositioning my fans. I have watched so many YouTube videos, including this one that found that mounting your radiator in the front of the case, with the fans on the outside blowing fresh air across the radiator, is actually the best for cooling, particularly if you have an open-fan graphics card, as I do. Unfortunately, my massive PC case, a Cooler Master Storm Trooper, does not have the option of front-mounting a 240mm radiator at the front of the case. I don’t know why, either! It just doesn’t. After trying literally every possible combination of fan configuration and airflow arrangement, this is the one that works best. It still isn’t great, but that could be for a lot of reasons. It works… fine? It works more or less like it always has. My temperatures get into the 70s during gaming, which isn’t great, and occasionally up to the 80s. My CPU is running at its stock 4.2Ghz with a turbo boost up to 4.5, with variable power topping off at around 1.2V. I’m once again left feeling envy every time someone in a comments section talks about how their liquid or air cooler keeps their overclocked CPU running in the 60s with a full load. One day, I think to myself. One day I’ll get there. I’m actually about ready to throw in the towel on all-in-one liquid CPU coolers. They just seem so prone to malfunction, and several of their key components can deteriorate over time. The one Cooler Master sent me a few years back was fine at first but eventually became annoyingly loud, and if I turned it down it wouldn’t keep the CPU cool. This Corsair one I bought last year seemed fine at first, but these days my temperatures tell me it’s just not working like it should. I’ve actually ordered a big honkin’ Noctua air cooler to see how that goes, since air coolers are so much more straightforward and everyone seems to swear by this one in particular. Maybe this way, I’ll finally be able to get my CPU running at a reasonable temperature and get on with my life. Maybe. Over the weekend, I realized that I was reading and putting a lot of stock in the findings and opinions of random YouTube commenters and Tom’s Hardware forumgoers, when I write for a major video game publication and have access to a large and diverse community of readers. So, I would love to turn this one over to you: If you play games on your PC, what cooling solution do you use for your CPU? How does it work for you, and what are your average temperatures? Help me find peace. Update: Added a mention of my specific CPU (an Intel i7 7700k) because that is probably important information to include in an article like this, lmao.